As Sarah tries to live with the knowledge that she and Keridan can never be together, she accepts a pledge of allegiance from the graduating class of agents. But this allegiance will be tested when an unexpected visitor arrives on Verindon; a visitor with a shocking secret. How will this affect Sarah’s reign? The Reign is Book 3 in the Verindon Trilogy, following on from The Heir and The Crown. 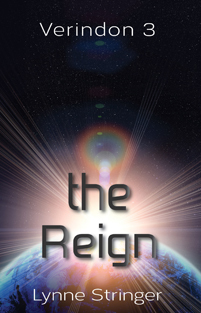 The Reign is available now! You can buy a copy from Wombat Books for $17.95 plus postage to ANYWHERE in the world for just $2.00! You can also order the entire trilogy for only $55.00 including postage to anywhere! Click on the Wombat Books button below to order! It’s also now available on Kindle and e-reader. Because The Reign is from Sarah’s point of view I couldn’t always put in all the information, particularly in relation to her kidnapping as a child. I have put the information here instead. Warning – they contain HUGE spoilers, so if you haven’t read The Reign yet do NOT click on these links.